Noria’s training course plan has something for all levels of expertise, from beginners to experienced technicians and engineers. Follow the entire course track, progressing from beginner to the expert level, or pick and choose according to your specific needs and interests. You will hear this course described as “foundational” or “laying the groundwork”. Noria’s experts and instructional designers recognized a widespread need for establishing or clarifying exactly what a best-practice-based lubrication program looks like, and ultimately created Machinery Lubrication I (ML I). You will learn proven industry methods for selecting, storing, filtering and testing lubricants to boost reliability and generate lasting results in machine efficiency/maintenance. You will also gain better understanding of oil analysis, so they can align their efforts with those of maintenance professionals or oil analysis experts. If you have already scratched the surface of the amazing improvement and resource-saving potential in good lubrication practices, ML II will round out your perspective with excellent preventive maintenance techniques. You will learn how to identify wear patterns, degraded lubricants, and those small but significant leaks that can spell disaster over a period of time. Lubricants can serve as a wellspring of information for preventive maintenance. If you find yourself wanting to bring the valuable benefits of on-site fluid testing to your workplace, Oil Analysis II will equip you with everything you need. You will learn what to look for when sampling and performing your own on-site oil tests – detecting harmful particle and thermal stressors that degrade lubricants before they do serious damage. If your dream is to reach high levels of diagnostics, analysis and even program design, Noria’s most advanced course is for you. You will learn the more detailed aspects of fluid analysis, technologies associated with it, and even how to go a step further from simply performing on-site tests to launch a strong oil analysis program at your workplace. 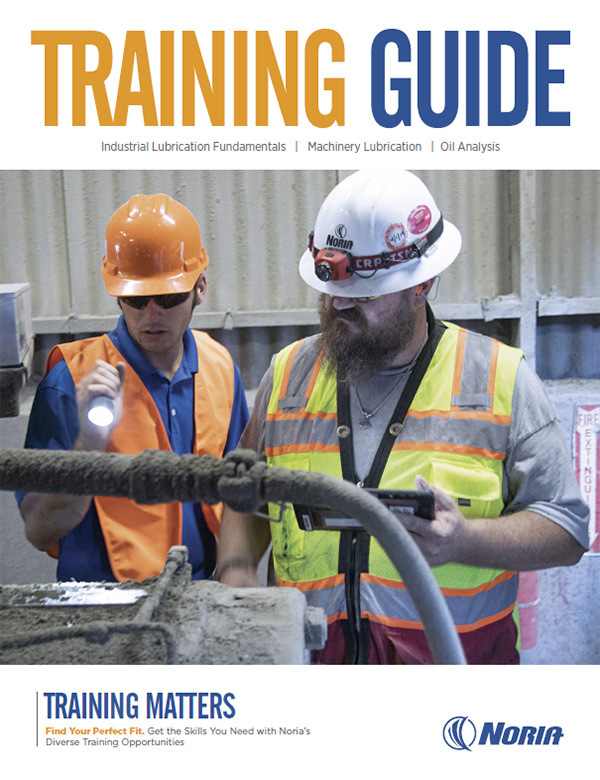 Industrial Lubrication Fundamentals is an introduction to optimal lubrication practices, which covers the common activities of a lubrication technician. This training is considered to be a key component to support a lubrication excellence program. This interactive course uses a variety of activities and media to provide the lube technician with the technical knowledge and methodologies of lubrication excellence, which enhance their competencies to execute qualified lubrication duties. When it comes to food processing, effective lubrication is fundamental to reliable and efficient manufacturing. When the Food Safety Modernization Act (FSMA) was enacted (2011), manufacturers contributing to the creation of food, pharmaceuticals and dietary supplements were mandated to implement systems and controls that specifically address the hazards which impact the safety of the food supply. This new law puts the burden on the individual company’s CEO and board of directors to ensure that the food produced is safe. The implementation of the Hazard Analysis and Critical Control Points (HACCP) and the Hazard Analysis and Risk-Based Preventive Controls (HARPC) emerged as primary guiding principles, shifting the focus on responding to contamination in the U. S. food supply to prevention. High-quality oil analysis is one of the most valuable tools in the condition-monitoring toolbox. Oil analysis labs work hard to place critical machine condition data at your fingertips, but it’s up to you to take it the rest of the way. In this course, you will learn a systematic approach to translating oil analysis reports into actionable maintenance decisions. You will learn how to select the right tests for measuring the right data points for specific processes, environments and machine conditions. The course also touches on achieving accurate and consistent data collection, removing data noise to accurately identify false results, elemental analysis interpretation, interpreting metallurgical composition combinations to identify wear modes, setting key performance indicators (KPIs) and alarm limits. Many of Noria’s training courses are built from the same foundational concepts, layering more detailed explorations or specialized topics in higher level coursework. The chart below gives a glimpse into which topics are emphasized in those courses as well as how technically detailed the information is. Marks range from the most basic (one) to the most advanced (four). Begin a free subscription to our weekly e-newsletter by entering your email below.